Last week the Plein Air Convention happened down in Monterey, which is a couple of hours away from me. I went down to hang out with whoever was going to be there after it was over. Fortunately I saw some good friends of mine from up north as well as locals and others. I met some new cool people, stayed out way late past my bedtime, and got to hear a lot of great things about the convention. Next year I'm going to go for sure. It's too tantalizing not to. Here are some studies I made in the area in between having fun. All three are on 8x10" boards. 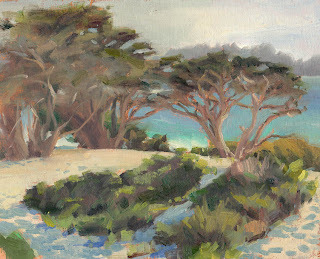 A 10x8" oil on linen board study near the Ghost Tree in Carmel, CA. 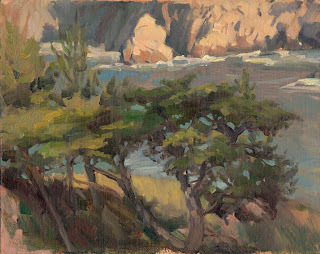 A 8x10" oil on linen board study in Point Lobos, CA SOLD. 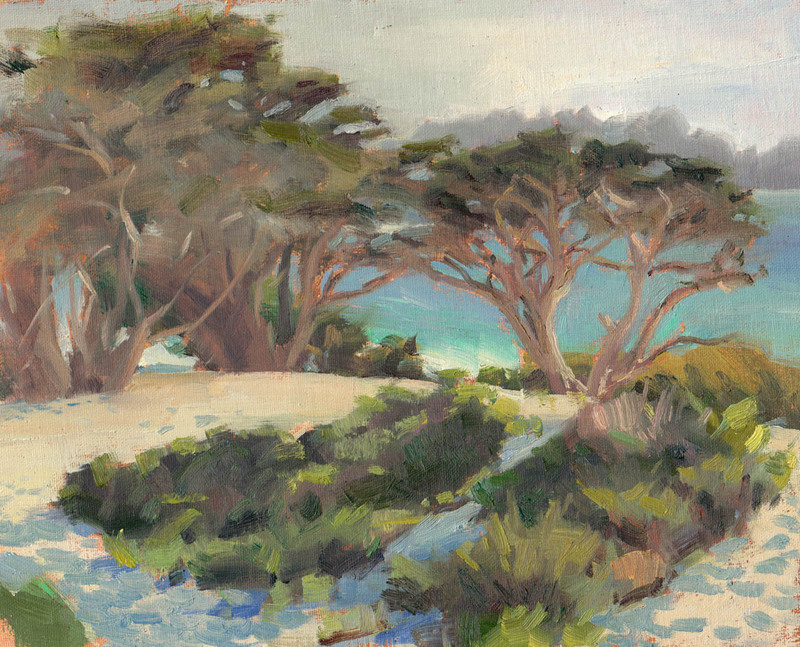 A 8x10" oil on linen board study at Carmel Beach, CA. Hey everyone, I built this paint box for my studio to replace the way-too-small palette I was using before. How they got the name "French Mistress" I have no idea, other than maybe the folks at Richeson were feeling bawdy in the naming office one day. Anyways, I took some photos along the way so I could tell you how I built this thing. The box holds a 16x20 sheet of glass for a palette. 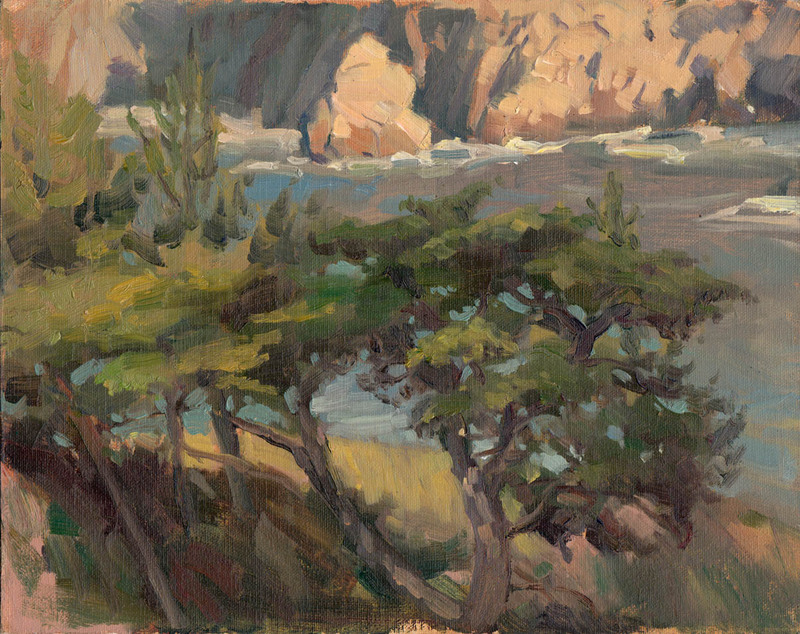 Sheet of wood, at least 44"x18". 6 poplar square dowels, 36"x3/4". Enough acrylic paint to cover a 16x20" panel. Colors: white+black/umber/etc(your choice). Step 1: I planned out what I needed. I took a sheet of birch plywood that I bought from OSH, but whatever sheet of wood that you prefer should work. 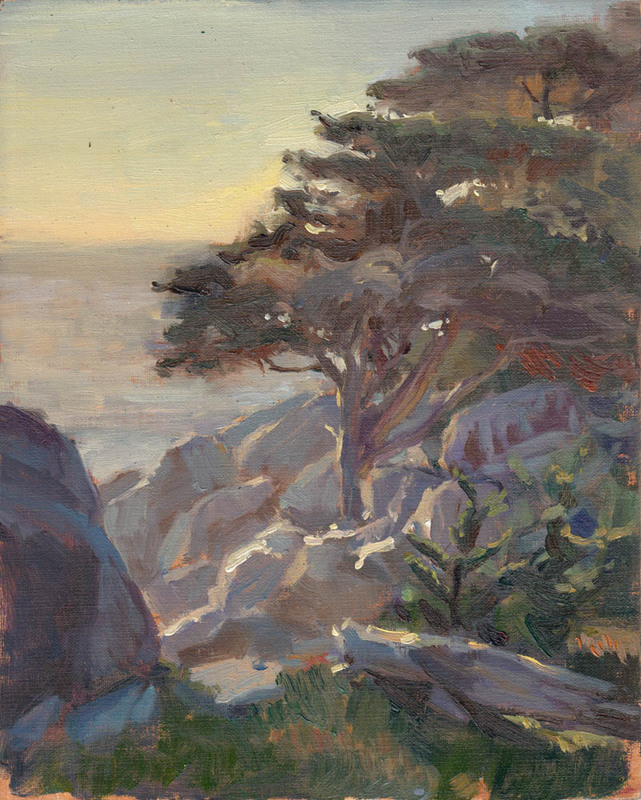 The one I used was slightly less the 24x48, with a 7/32" thickness. I also got 6 36" poplar square dowels with a 3/4" thickness. I then cut opposing 45° at the ends of each of these newly-cut poplar squares. Step 4: I then glued poplar dowels to the freshly cut birch panels. It helps to have C-clamps to make sure they adhere to the panels, if you have them handy. *Sidenote: If you want to make these into canvas panels, simply stop here and glue canvas to the front side of the panel. Step 5: I next applied several coats of wood finish to every exposed part of the wood with a bristle brush. Step 6: Once the wood finish dried, I applied a couple of coats of shellac to each side of the panel. I then waited a few minutes for it to dry. Step 7: I then screwed the piano hinges to the sides of the poplars so that the hinges fold inward. This will make sure the box closes shut. Be careful to line up the hinge with the edge so that the box closes straight. Step 8 (optional): I screwed in 8 decorative corners to the box(4 on the bottom, 4 on top). Not only do they help protect the corners from getting banged up, but they add a touch of class to the box. Step 9: I screwed one brass toggle catch on each side of the box lid. This will make sure the lid doesn't open if you move it. Step 10: I like mixing on a toned palette, so what I did was take a mix of white/burnt umber/red oxide acrylic paint(well mixed, no streaks), covered one side of the glass, let it dry, flipped the pane over, then set it aside. Step 11: I spread silicone caulk and applied it to the sides and corners of the box, and an X in the center of the box. Step 12: I set the pane painted-side-down into the box, let the caulk dry to seal the palette to the box, and lay some paint down on it! Optional mods: I drilled a screw into the side of the right-hand box lid. When I slide my palette cup around the screw, it makes sure it doesn't slide everywhere when you're using it. I also cut 4 foam squares to glue to the corners of the lid. This will cushion the lid when you close the box, as well as help it the box top lay flat while closed. Let me know if you have any improvements to the set-up! I'm all ears. I've been really stoked lately to be working on paintings of animals for a group show. The show is called "Animal Fare" and it's going to be for the Christopher Queen Gallery. I've always loved animals, yet for some reason I've not painted a whole lot of them. This show may change that a bit. To kick off my contributions to the show, I've painted portraits of some of my friends' pet dogs. 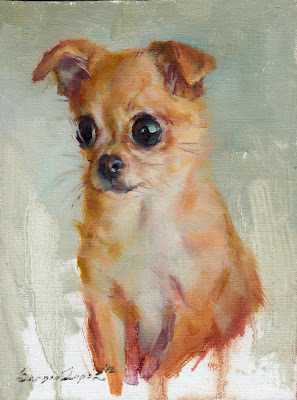 My friend Nicole is a vet at UC Davis with a penchant for these small fragile dogs which are super-cute yet require much health maintenance. "Fuu" (Japanese for wind) is a little mixed breed dog which looks like a perpetual puppy. Despite her size and huge brown eyes, her proportions are that of a full-grown dog, just shrunken down. Although her head is sort of chihuahua-esque, her body is a lot more like a beagle's proportions. She is very well-mannered (I've maybe heard her bark once) and incredibly sweet. She has more heart than her little body can handle. I've liked Jack Russell terriers for a really long time(anyone else remember that show Wishbone?). They're a fun breed but they need a lot of space to run around and be as rambunctious as they need to be. I snapped some photos of Desmond in my friend's big South Carolina backyard, where he's got plenty of room to run around and be the dog he wants to be. He has a very handsome profile, which inspired me to paint him. 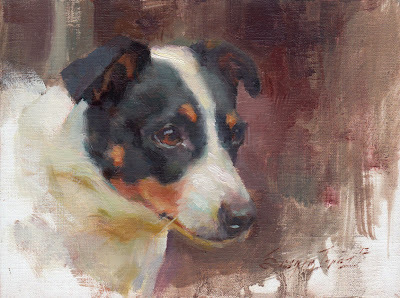 There is some undefinable nobility in his face that I tried to capture in this painting. Did I succeed?